Two Google+ Local Links On One Place Listing? Typically if you search Google for local results, you may see a link to the business Google+ page. But do you ever see two different links to Google+ pages under one listing? Typically not. But in one case, you do. 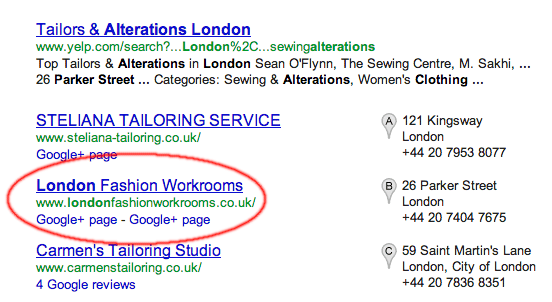 Search for [suit alterations london parker street] and the result for londonfashionworkrooms.co.uk has two Google+ links under the local results. What is interesting is that the Google+ page is the same, the only difference is that one links to the posts and the other links to the about section, but the Google+ company page is the same. Interesting... looking into it. Thanks for reporting. If it was me, I'd probably stay quiet and take the extra link. Forum discussion at Google Local Help.